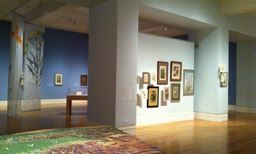 “Recapturing California’s Wildflower Heritage” – Huntington exhibit which drew attention to the rich heritage of wildflower illustration and took a closer look at California’s natural and horticultural history. “When They Were Wild: Recapturing California’s Wildflower Heritage,” showcased more than 300 items—drawings, paintings, herbarium specimens, photographs, and other objects—that trace the journey of California’s plants from the flower fields into the home garden. The exhibition was a collaborative project of The Huntington, Rancho Santa Ana Botanic Garden in Claremont, Calif., and the Theodore Payne Foundation for Wild Flowers and Native Plants in Sun Valley, Calif. Works from all three collections, along with loans from several other public and private collections, were on view in the Huntington show, with related displays at the two other institutions and at the Santa Barbara Botanic Garden.